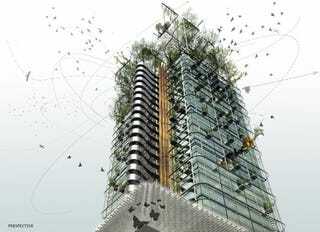 From green roofs to tree filled corridors to entire high rise floors left to plants and wildlife, forward looking architects are combining technology and imagination to bring nature into modern homes and buildings. Greening your home or building can have a host of benefits. For Anthi Grapsa and Konstantinos Chalaris' entry in the Piraeus Tower Competition 2010, modern agricultural techniques are incorporated on the upper floors in order to resolve the problematic green space to inhabitant ratio of the town. In MVRDV's "Pushed Slab" energy efficient office building, balconies and terraces will house potted trees, offering employees a relaxing place to socialize. An expansive green roof like that of Studio Shift's Stadt Krone concept provides a vast area to utilize for agriculture, below which thousands of city inhabitants can reside. Other green roofs, like the Vivanta Hotel's, are more economical, providing reduced heating and cooling needs for the building below, along with a mechanism for capturing rainwater to later be used for irrigating the grassy roof.